I have written about Book Creator before but this is worth a mention. The latest update allows you to add sound files to your books. In simple terms this allows my students to blend the two language skills of reading and writing. Last week we were focusing on structuring written work. Using the iPads makes this so much more interesting than just writing in an exercise book. The first lesson started with a clip from Clipbank. The school has a subscription to this resource from Channel 4 and I was pleased to find that the video clips play on the iPad. We then sorted vocabulary into categories before playing a Cluedo style game. I had emailed a Keynote file to the pupil iPads with the relevant slide so that they could get involved with physically moving the vocabulary into the relevant box (person, activity, room). One point here – I did this with two classes. With the first class I did not foresee the time it would take to simultaneously download the file onto 15 iPads (it was only one slide after all). For some reason the pupil iPads keep losing the Apple network and defaulting to our Guest one. I have not worked out why yet. It is possibly proxy settings as I do not have the same problem with mine. As it is I need to remind pupils to go back into the Settings to select the correct network. I also never even considered that if a pupil deleted the email it would disappear off the other iPads – they all run off one email account. I have them set up with Dropbox too so should have used that. When I repeated the lesson with the second class I ensured the file was loaded in Keynote so we did not waste any time. The game involved pupils making accusations e.g. “À mon avis Colonel Moutarde écoute de la musique dans le bureau” thus linking opinions, present tense of regular -ER verbs and rooms. I answered with a simple 0, 1, 2 or 3 and pupils had to eliminate suspects etc. I saw a version of this game demonstrated by John Connor at an MFL conference in Dartington a couple of years ago. He did a Spanish version and Chris Harte gave him a French version. I simply adapted it, but it works beautifully as pupils have to speak, listen, eliminate, deduce and use all those higher level thinking skills we want to see them using. Many thanks to both John and Chris. Using the keynote slide meant they could physically move eliminated clues from the boxes. I have always done this with laminated cards before. After playing the game pupils were told they were going to create their own books using a similar structure. Less confident pupils were told to use the present tense structures I had provided and just change the people/place. More able were encouraged to try other regular -ER verbs (we had spent a previous lesson on the structures). I was pleased at the end to find the most independent pupils had used other language and there had been some rather good uses of Google Translate after we had discussed strategies for getting an accurate translation. This post has stemmed out of the added bonus of the sound files and the impact it had on one of my pupils who is bright but has autism. She often works alone but with only 15 iPads to a class of 33 pupils had to pair up. The book that she and her partner produced was delightful. The structures were simple, but followed the format I had given them. What made it was the sound recordings and the photos. She would never have said so much in one lesson normally and the photos showed real care in expressing the actions that were bring written about. This is the sort of SEAL activity that is so valuable for our SEN pupils. If took two lessons to complete all the tasks above and on the third lesson of the week the pupils emailed me their ePubs. 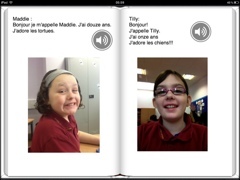 Once safely on my iBook shelf we looked at them as a class and peer assessed them. Comments were varied but constructive: ‘why did only one of the pair speak?’, ‘the accent was good but the volume could have been louder’, ‘nice, clear images to illustrate the French’, ‘you shouldn’t use images that have a copy-write’, ‘they’ve used connectives’ and so on. And the moment that I will cherish as a teacher? Showing the book to my pupil’s parents at parents’ evening. This is one series of lessons I will definitely be repeating next year.